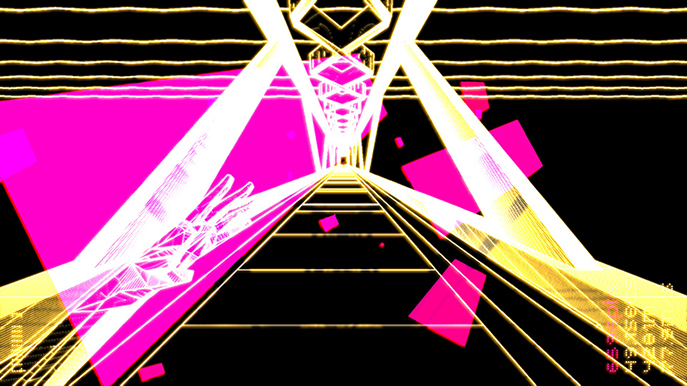 Fotonica is a first-person, single-button runner in which your aim is simply to reach the end of the stage. Presented in a minimalistic manner, it requires the player to concentrate and have a good reaction response time in order to traverse the obstacles and platforms. In this updated release, new modes and features have been implemented that improve the overall experience. The gameplay is simple: press and hold any button to run (controllers are supported), let go to jump and holding any button while in the air will bring you down at a faster speed. Each level has you running straight ahead across floating platforms. Most of the time there are multiple platforms at different heights. Inexperienced players may want to stick to higher platforms, with potential safety if a jump is missed, though more rewards lie in sections with trickier platforming. There are collectables called dots scattered among the levels. These add points to your overall score. Do well enough in a level and you'll activate a state in which the white turns orange and your speed is increased. There is a fantastic sense of speed in the game. You run through the landscapes at a high pace, increasing after a good series of jumps and boosting your speed about fifteen metres per second when you go into that orange state. 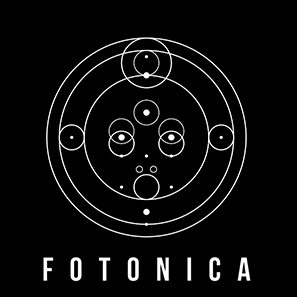 This is where some of the more challenging aspects of Fotonica can be found. Jumping from platform to platform is comfortable and judging landings is fine; when you're going at such fast speeds, landing on and then launching from a platform takes some practice to get right. Some of the later levels require you to have sharp reactions and you'll plummet into the depths below many times. Thankfully, there is an instant restart for when this happens, though there are no checkpoints. You'll spawn at the start of the level. 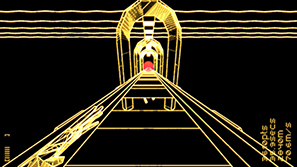 By default, you play on the second level of difficult; there are four in total. The differences in these difficulties is the speed of the runner. Playing on IV: impetuoso, is a real challenge (though I completed the first level in one attempt) and you'll reach speeds of around eighty-five metres per second. Aesthetically, Fotonica is a success. 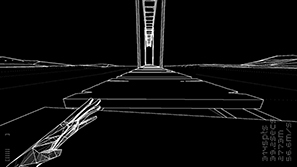 The black and white wireframe look is clean and allows the player to focus on the gameplay. The occasional inclusion of colour is effective; shards of reds when you collect a dot, blue lines rushing past you as you're landing from a jump and the orange of that upgraded state. They are used subtly enough to not appear as a distraction while you concentrate. There are eight levels which include some new ones for this release. The returning levels still suffer from the same problem: they are too easy. I found myself being able to finish them in just a few attempts (or in a single attempt in a couple cases) and there isn't a lot of enjoyment to be found in them. However, in the newly added levels it feels like the developers have been more ambitious and adventurous in the design. More complex and varied wireframe landscapes surround your running path and the difficulty is ramped up considerably. The penultimate level particularly caused me problems, and I felt great satisfaction when I ultimately reached the finish. The final level, 'ROMOLO', is a fantastic change of pace and challenge from the other levels. It requires you to fully focus and time your jumps to perfection due to a startlingly different landscape around you. I just wish there were more levels like that. 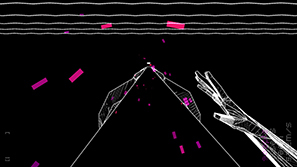 There are three modes in Fotonica – arcade, endless and multiplayer. The arcade mode is where you'll play through the levels; unlocking the next on completion of the previous. 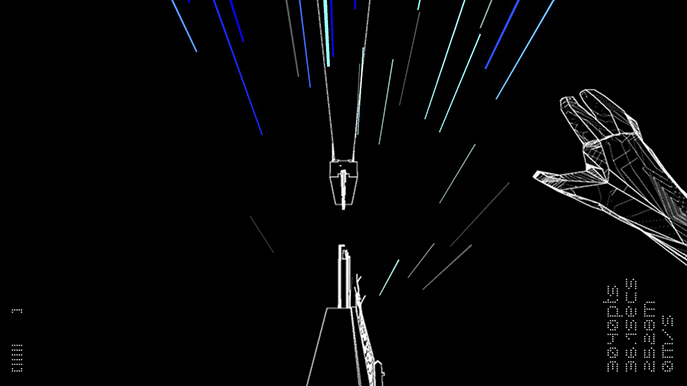 Endless has three procedurally generated levels in which the aim is to go as far as you can. Multiplayer is local and supports up to four players. You compete in a race to the finish. There are a few changes in this mode: you don't see your animated hands at all, if you fall off the track you re-spawn at a suitable place and players leave a coloured trail so that trailing competitors can see the route taken. Fotonica is a fun experience but it can be completed in a relatively short time. It's up to the player if they want to finish the levels on the harder difficulties but if not it can be finished in an hour. The aesthetics are striking and the electronic soundtrack fits very well. The overall sound design is strong, with loud thuds from when you land from a big jump and grunts from the runner when launching. The biggest problem is the difficulty; the returning levels remain too easy and the enjoyment in the trickier levels is short lived as there aren't enough of them. 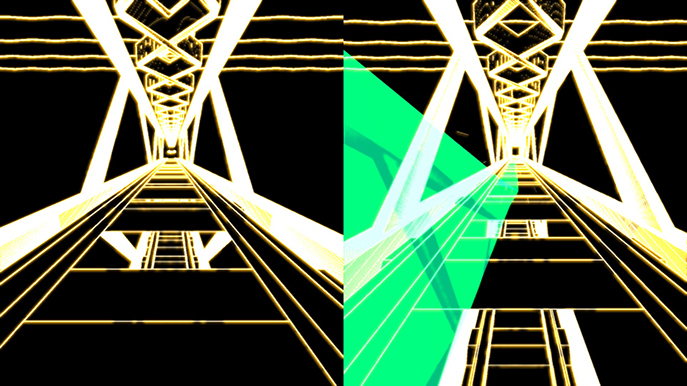 If you enjoy runners you'll have a good time with Fotonica while playing. There is some challenge here and the later levels are a lot of fun to play. - Not enough of the improved new levels.